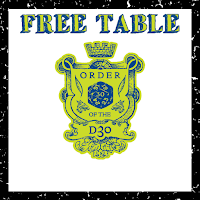 This month's freebie (well, technically PWYW) d30 table is up on DriveThruRPG for download. That game had a mechanic for altering the value of gemstones based on quality and size. Of course rolling on five separate tables or sub-tables can be a bit much, especially since you'll need to use three different sets of dice. Nope, one d30 is all you need with a minimum of two rolls and a maximum of four. These tables should pretty much be drop-in compatible for any OSR game. My next few tables are likely to be for other types of treasure.